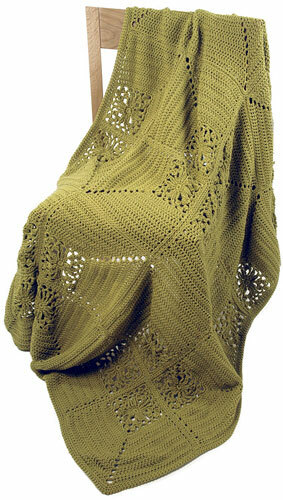 Andalusia is a solid colored crocheted throw with a modern arrangement of double crochet and floral motif blocks. 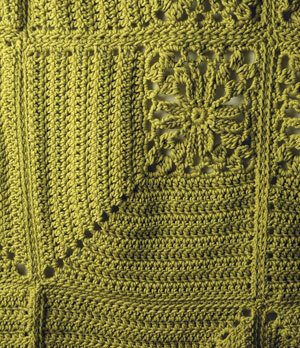 Flower: With crochet hook, ch 5. Join with a sl st to form a ring. Rnd 1: Ch 1, work 12 sc’s into ring, join with a sl st in first sc. Rnd 2: (Ch 12, sl st in next sc) 11 times, end ch 6, tr in sl st (counts as ch 12). Rnd 3: Ch 3 (counts as 1 dc), dc2tog in loop formed by tr on rnd 2 (this is beg loop) , ch 3, (sc in next ch-12 loop, ch 3) twice, * (dc3tog, ch 4, dc3 tog) all in next ch-12 loop (corner made), ch 3, (sc in next ch-12 loop, ch 3) twice, rep from * twice more, 3dctog in beg loop, ch 4, sl in top of beg dc2tog – 4 corners made. Rnd 4: Ch 3 (counts as 1 dc), dc2 tog in beg loop, ch 3, (sc in next ch-3 space, ch 3) 3 times, * (dc3tog, ch 4, dc3tog) all in ch-4 corner space (corner made), ch 3, (sc in next ch-3 space, ch 3) 3 times, rep from * twice more, dc3tog in beg loop, ch 4, sl st in top of beg dc2tog – 4 corners made. Rnd 5: Ch 1, 3 sc in beg space, (3 sc in next ch-3 space) 4 times, * 5 sc in ch-4 space of corner, (3 sc in next ch-3 space) 4 times, rep from * twice more, end 2 sc in beg space, join with a sl st in first sc. Beg Sides: (Work back and forth on 2 sides of flower). Row 1 (RS): Ch 3 (counts as 1 dc), dc in each sc to center sc of next corner, (2 dc, ch 3, 2 dc) all in center sc, dc in next 17 sc’s – 19 dc’s on each of 2 sides with ch-3 space at corner. Turn. Row 2: Ch 3 (counts as 1 dc), skip first dc, dc in each dc to ch-3 corner space, (dc, ch 3, dc) in ch-3 space, dc in each dc across, dc in top of ch-3 – 20 dc’s on each of 2 sides with ch-3 space at corner. Turn. Rep Row 2 eight times more (you will have 1 more dc on each side every row) – 28 dc’s on each side with ch-3 space at corner. Turn. Edging: Rnd 1: Ch 1, work 2 sc in first dc, sc in each dc to ch-3 space of corner, 5 sc’s in ch-3 corner space (corner made), work 1 sc in each sc to ch-3 at beg of row, work 3 sc’s in top of ch-3 (2nd corner made), working down side of dc rows, (work 1 sc over next edge st, 2 sc’s over next edge st) 5 times; working around flower, skip joining st, (sc in next 3 sc’s, skip 1 sc) 3 times, sc in next 4 sc, 3 sc’s in next sc (3rd corner made), sc in next 4 sc, (skip 1 sc, sc in next 3 sc) 3 times, skip joining st; working up side of dc rows, work (2 sc’s over edge st, 1 sc over next edge st) 5 times, end sc in same dc as beg 2 sc’s, join with a sl st in first sc. Fasten off. 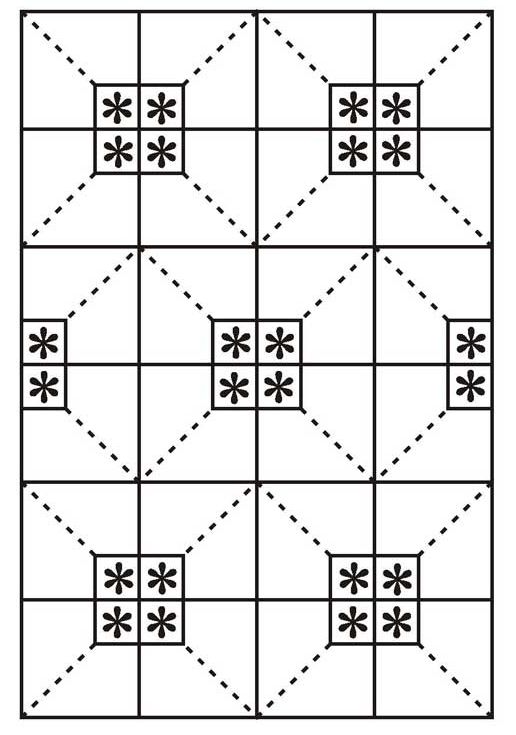 Turning squares so that flowers are in same position as on diagram, sew all squares tog through back loop. 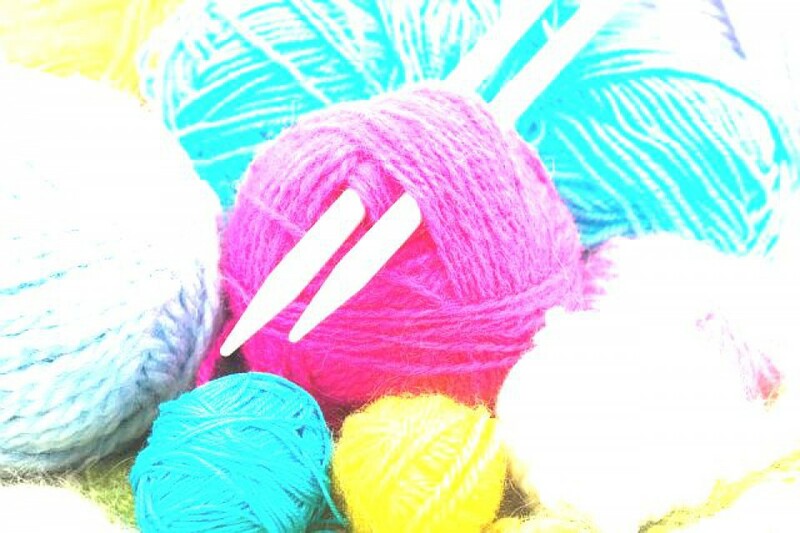 Edging: With RS facing, using crochet hook, join yarn in any corner, ch 1. Rnd 1: Ch 1, working in back loop only of each st, work 2 sc’s in same st as joining, sc in each sc to seam, * sc in seam, sc in each sc to middle sc of next corner; work (3 sc in corner sc), rep from * around to beg corner, sc in beg sc, join with a sl st in first sc in back loop. Rnd 2: Ch 1, 2 sc in same sc of joining, working in back loop only, sc in each sc to middle sc of next corner, * work 3 sc’s in corner sc, sc in each sc to next corner, rep from * around to beg corner, sc in beg sc, join with a sl st in back loop. Rnd 3: Ch 1, turn, work 1 sc in joining and in each sc around through both loops; join with a sl st in first sc. Fasten off.